concerned they’re losing sales because of poor – or nonexistent – systems. Sound familiar? If you’ve been searching business software solutions to manage your business better, you have to take a look at Zoho suite of business applications. It’s time to trade in your sales tracking spreadsheet and move up to the productivity tools available in the Zoho suite of small business apps. 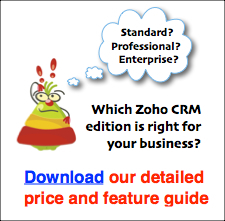 “Zoho is the most comprehensive suite of web-based programmes for small businesses”. 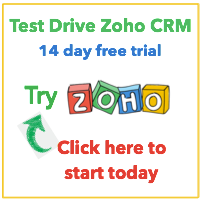 Use Zoho to manage projects, build a contact management database, increase your team’s sales effectiveness, and track sales performance. Don’t stop there . . . Whether you’re a current Zoho customer who’d like a bit of hand holding or an enterprise looking for a turn-key solution, we’ll help you build a system that let’s you focus on what’s really important (like improving marketing strategies, hiring that new sales rep, or getting a life). If you’re considering Salesforce.com as a solution, take a good look before you leap. It’s not that it’s not a good product, it’s that it’s often too much for smaller companies. Too much of a learning curve, too many features users are forced to wade through, and too difficult to customize. And unless you like paying for stuff you don’t use, at $65 or $135 per use per month, it’s just too expensive. As certified experts in CRM, email marketing, and content marketing, Your CRM Team has helped hundreds of small and medium businesses grow to be more successful since 1999. And, as an added bonus, we’re fluent in sales rep and Certified Jargon Free. 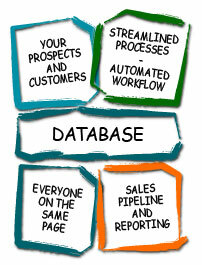 Are you ready for a business solution that managers need and that sales people love? Contact us or sign up for a free, no obligation trial.